Restylane Silk was one of the first fillers specifically designed for injection into a particular area of the face. This custom filler was created for injections into the lips for a non-surgical lip augmentation. 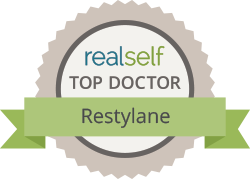 Restylane Silk is composed of a naturally occurring substance in the body, hyaluronic acid. Hyaluronic acid helps support and cushion cells in the body. Other common hyaluronic acid fillers include Juvéderm, other Restylane products, and Belotero. What Makes Restylane Silk Unique? All hyaluronic acids slightly differ in their composition in regards to their thickness and viscosity. Restylane Silk’s composition is soft and more gel-like compared to other hyaluronic acid fillers. This composition is ideal for injections into the lips. How is Restylane Silk Injected into the Lips? The lips are one of the most precious and delicate facial features. For this reason, Dr. Jonathan Kulbersh prefers to inject the lips slowly over two sessions for first time injection patients. Dr. Kulbersh will perform the lip injections and have the patient come back in approximately two weeks for an evaluation. After the first injection, the patients will notice an improvement in the fullness and volume of the lips. At the appointment two weeks after the initial injection, Dr. Kulbersh and the patient will decide if additional filler is warranted. What are the Goals of Restylane Silk Injections into the Lips? Lip augmentations with Restylane Silk are able to improve the fullness, volume and height of the upper and lower lip. It can also help improve symmetry in some patients. How Long is the Procedure for Lip Augmentation with a Blunt Tipped Micro-Cannula? One of the advantages of using a blunt tip micro-cannula is the short time it takes to perform a lip augmentation. A lip augmentation with a blunt tip micro-cannula will take approximately five minutes. Are Lip Augmentations with Restylane Silk Painful? We take many steps to ensure patient comfort during the injections with Restylane Silk. Restylane Silk contains numbing medicine in the filler itself. While filler is being placed in the lips, numbing medicine is being placed at the same time. Using a blunt tip micro-cannula will limit discomfort during the procedure. Overall, lip injections done with the blunt tip micro-cannula by Dr. Kulbersh are very well tolerated. Each successive injection into the lips is better tolerated. How Much Does Lip Augmentation with Restylane Silk Cost in Charlotte? Lip augmentation with Restylane Silk in Charlotte varies depending on each location. Please call our office to find the current price of Restylane Silk lip augmentation. How Does Dr. Kulbersh Prevent Duck Lips? The number one concern patients have about undergoing lip augmentation is to prevent the appearance of duck lips. Duck lips are caused by overfilling the border of the red lip with normal skin of the lip. This will create an unnatural fullness and appearance of duck lips. Natural augmentation of the lips is created by injecting the deeper tissues of the red lip in a uniform and smooth technique. During lip augmentation, it is important to limit the amount of filler at the border of the upper lip and at the corners of the lips. Dr. Kulbersh’s technique of injecting the deeper tissues of the red lip with the blunt tipped micro-cannula will create a fuller and voluptuous lip, as well as prevent the formation of duck lips. Why Choose Dr. Kulbersh for Lip Augmentation in Charlotte? Dr. Kulbersh is a double board-certified facial plastic surgeon. He has vast experience and knowledge with both the anatomy of the lips and lip injections with the blunt tipped micro-cannula. The most important part about undergoing lip filler is to choose an injector that has the skill and knowledge to create a beautiful and natural appearing result. Trust your lip fillers to an expert such as Dr. Kulbersh. How do you make a consultation for Restylane Silk injections in Charlotte at Carolina Facial Plastics? Please call our office at (704) 842-3644 or fill out the online consultation form.